Aqua Knobby follows a line of sweet knobs and flakes up a gray water streak on the north side of Pywiack Dome. Despite being right next to the road, stories about the runout 5.6 slab first pitch and the horrendous old bolt protecting a crux 5.8 runout have kept most away. The ASCA replaced the bolt in 2001, and the first pitch is easier than rumored. 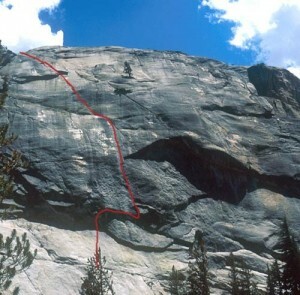 While most of the climbing on Aqua Knobby is easy and low-angle, the steep crux pitch is one of the finest in Tuolumne. Which SuperTopo guidebooks include a topo for Aqua Knobby?